Gstaadlife | Will the Saanen region have snow in the summertime? Will the Saanen region have snow in the summertime? Snow farming can help to ensure a longer winter sports season and can guarantee snow for events. So, could the Saanen region benefit from this new technology? 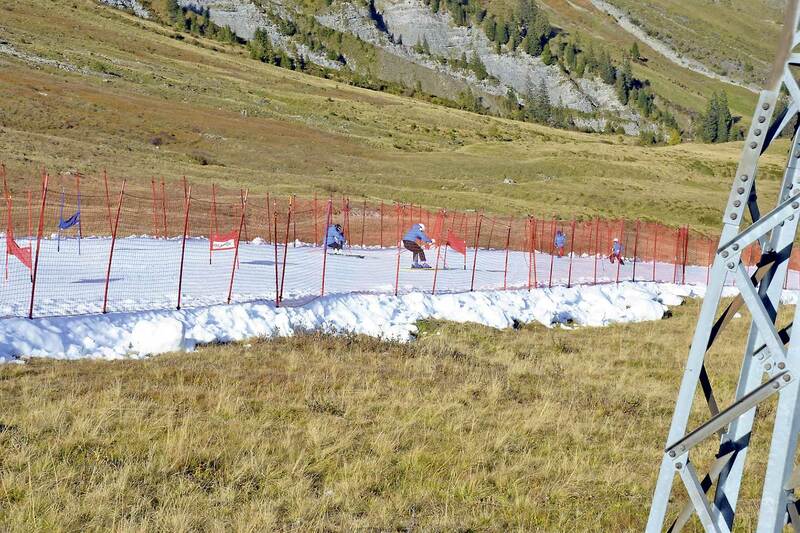 Given the lack of snow brought on by our climate, more and more winter sports resorts are relying on snow farming. This method means that, at the end of winter, the residual snow is gathered into large piles and covered with a layer of sawdust, woodchips or fleece. Over the summer, only about 20% of the snow will melt. The preserved snow can then be used for cross-country ski tracks, ski slopes and ski jumps at the start of the following season. This not only enables a punctual start to the winter season, but also guarantees snow for scheduled events such as ski races. However, among the downsides are the high cost of the process and the difficulty finding a suitable storage space. Both can be particularly problematic. Adelboden's pioneering efforts allowed 24,000 cubic meters of snow to be stored over the winter for use in the springtime. The project was led by Reto Däpp. At the end of April 2018, the depot in Adelboden was protected with a fleecy cover that allowed the water to drain off. In October of that year, the snow was used to prepare a 500-meter-long ski run on Tschentenalp, giving this an 80-centimeter thick covering of snow. "The region’s juniors benefited from an early start to their training and the tourists visiting the slopes are a positive spin-off too," says Jürg Hänggi, media officer for the Adelboden training centre. The managing director of BDG, Matthias In-Albon, is critical of snow farming and the example set by the neighbouring valley, despite his own positive experiences at 2800m above sea level. Financing the Tschentenalp project has only been feasible through countless hours dedicated by volunteers and the quality of the spring snow. However, this snow is already past its best and is continuing to decline when kept over the summer period. In-Albon sees snow farming as a "marketing ploy". "Due to the size of the ski area and the existing snow-making methods, it’s no good for us. There’s a huge cost involved in piling up the snow in the spring, protecting it over the summer and laying it out again in the late autumn. Sustainability and the efficient use of energy are out of the question here." Currently, The BDG can’t see a meaningful or profitable way of preserving the snow to this extent. Snow farming could help with a lack of snow for alternative winter sports like cross-country skiing, toboggan runs or snow parks. For example, in 2017, the cross-country ski trail between Schönried and Saanenmöser wasn't open until 17 January because only ski slopes benefitted from the artificial snow. Cross-country skiing has gained in popularity in recent years. However, for snow farming projects to be successful in the Saanen region, the political framework must be right. Snow farming is a controversial topic. It may seem like a good idea in theory but has yet to be proven in practice. For the time being, the Saanen region will stick to the tried and tested methods. However, depending on the climate and the needs of winter sports, snow farming could be beneficial all round.